He described Barker as a "busy evergreen" with a packed schedule. "He's going to go snowboarding," Dussault revealed. "He's going to play tennis. He's going to go on a hike. He's got his Birkenstocks, which reflects his passion for yoga. And he's going to do it all in one day." He explained that the art is designed to show that it's possible to do a bunch of activities all in the same day in Vancouver. Dussault, who's based in Vancouver and New York, noted that he's gone snowboarding, played hockey, and gone out on the golf course within a 24-hour period in our town. "There's not many cities in the world that I think you can experience all of those things," he said. "I think it's fitting to have a place where people can take a photograph of the name of the city to share around the world and say, 'You know, I was there.' Then I wanted to create a character that people would want to take a selfie with." Usually, Dussault works on his own. His pop-culture characters are now being shown in the Hoerle-Guggenheim Gallery in New York, where he lives for part of the year. 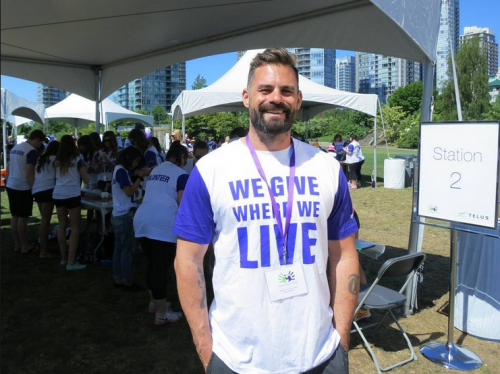 Telus has financed the project and supplied the volunteers as part of the company's Days of Giving program. It runs from mid May to mid June, culminating in the Telus Walk to Cure Diabetes in Stanley Park and many other locations on June 14. Telus executive chair Darren Entwistle and several company vice presidents were among those in David Lam Park hammering away to create tiles for the mosaic. "This organization within British Columbia is approaching $200 million of giving since 2000," Entwistle told the Straight. "This is an organization that is approaching three million hours of volunteer time within this province." There were a lot of hammers on-site banging out mosaic tiles. The company has not revealed where the mural will go. One thing is certain: it won't be attached to the company's new downtown headquarters, Telus Garden, according to Entwistle. Telus's vice president of community investment and engagement, Jill Schnarr, told theStraight that this will be the first mural in the city with the name Vancouver written on it. "We think it will be a great draw for tourists and residents to come and take photos and videos and really enjoy their city," she said. Jason Dussault double-checked the colours being used by volunteers. Dussault said that it would have taken him a year to complete the mural if he didn't have all of the volunteers helping him. He added that he's excited to see how people inject their personalities within their abstracts. "Each way they cut and lay that tile will be unique to them," he said. "So we're really going to see a mash-up, especially in the lettering of all the different styles coming together." Dussault biggest concern is the colours He confessed to being a bit worried about how they might line up, prompting him to go from table to table to double-check this aspect of the job. "Other than that, I feel really comfortable," he said. "I'm really hoping that this piece becomes a destination." Everyone involved wore the same style of T-Shirt. David Lam Park where the mural was being created.